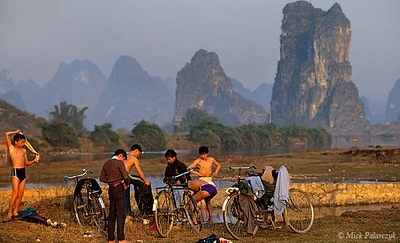 [CHINA.GUANGXI 25.364] ’Dressing up.’	School-boys are dressing up after a dip in the Yulong River near Chuanyan village west of Yangshuo. Photo Mick Palarczyk. 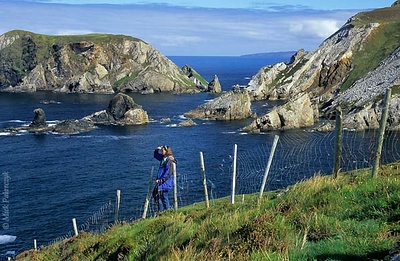 [IRELAND.DONEGAL 21.792] ‘Coast at Port.’	At Port, north of Glencolumbkille, sea-stacks and little islands give the Donegal coastline a dramatic appearance. [USA.ARIZONA 28007] 'Taking a nap in The Wave.' 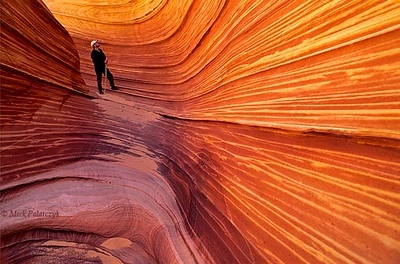 The hiker who enters "The Wave" in the Coyote Buttes nature reserve (part of the Vermilion Cliffs Wilderness) may find himself surrounded by a dream-like sandstone landscape. The fine layers of the stone are composed primarily of wind-blown sand from a vast ancient desert. Photo Mick Palarczyk. [USA.UTAH 28064] ’Layered sandstone.’ A small dry valley above the Paria Canyon shows a finely layered bedrock surface that is composed primarily of wind-blown sand from a vast ancient desert. Later the desert dunes were covered by other materials, they petrified and surfaced again when the Colorado Plateau was uplifted and then eroded. The canyon of the Paria (a tributary of the Colorado) can be found east of Kanab and south of route 89. Photo Mick Palarczyk. [USA.UTAH 28086] 'Satin sail in Buckskin Gulch.’ The spectacular ‘polished’ walls of the Buckskin Gulch, a branch canyon of the Paria River, are formed during flash floods as stones and pebbles hit the walls at great speed. Sometimes you seem to encounter the gracefully curved sail of a ship from the underworld, woven of the most delicate satin. Photo Mick Palarczyk. 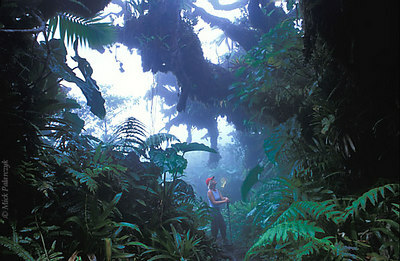 [ANTILLES.SABA 25.539] ’Foggy forest walk’. Walking through the Saban cloud forest is most special just after sunrise, when a mysterious blue light pervades the wood. Photo Mick Palarczyk. [ANTILLES.SABA 25.548] ’Artist’s paradise’. 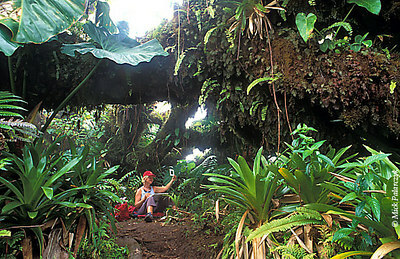 On the summit of Mt.Scenery the Elephant ears, Mountain mahoganies and bromeliads of the cloud forest form an inspiring subject for an artist. Photo Mick Palarczyk. [TURKEY.CENTRAL 26960 'Tourists on Tuz Gölü.' 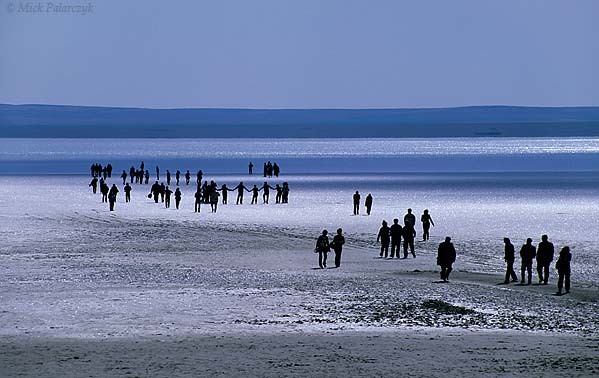 The thick salt crust of Tuz Gölü is a favourite spot for Turkish tourists. The whiteness and sparkle of the salt crystals on this big lake south of Ankara look deceptively like snow and ice. Tuz Gölü receives its salt from several underground salt water springs. Photo Mick Palarczyk. [BRITAIN.IRELANDNOR 21.851] ‘Fin’s bridge.’	The basaltic rock columns of Giant’s Causeway are battered by the Atlantic Ocean. According to myth the Causeway was built as a bridge to Scotland by the giant Finn, who wanted to test his strength against his Scottish rival Fingal. [BRITAIN.SCOTLAND 23.509] ’Dead tree’. 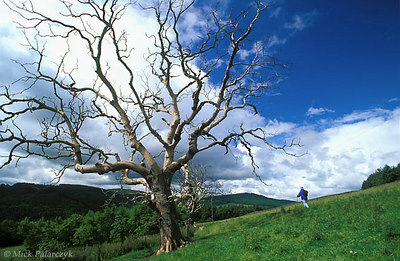 On the slope of the Tweed valley north of Selkirk a dead oak tree is just managing to keep upright. Photo Mick Palarczyk. 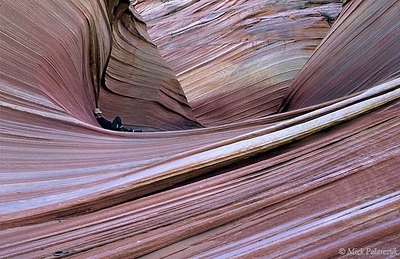 [USA.ARIZONA 28000] ’Hiker in The Wave.’ The hiker who enters "The Wave" in the Coyote Buttes nature reserve (part of the Vermilion Cliffs Wilderness) may think he is stepping into a sticky red fluid with white stripes, something like sour cream stirred into pumpkin soup. But this geological wonder actually consists of 200 million years old fossilized sand dunes. Photo Mick Palarczyk. [USA.UTAH 28089] 'Stegosaur in Buckskin Gulch.’ The spectacular ‘polished’ walls of the Buckskin Gulch, a branch canyon of the Paria River, are formed during flash floods as stones and pebbles hit the walls at great speed. At some points they seem to resemble the scaly back plates of a Stegosaur. Photo Mick Palarczyk. 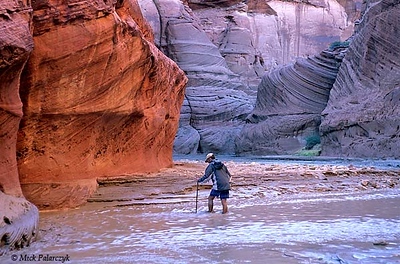 [USA.UTAH 28083] 'Paria Canyon.’ A trek through the colourful Paria Canyon involves crossing the water every hundred meters. Using a stick can help you to avoid quicksand. 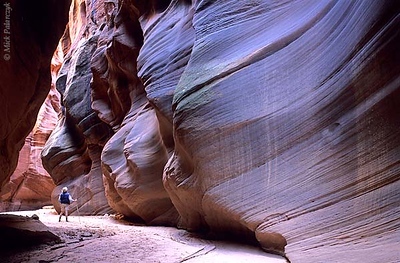 The canyon of the Paria (a tributary of the Colorado) can be found east of Kanab and south of route 89. Photo Mick Palarczyk. 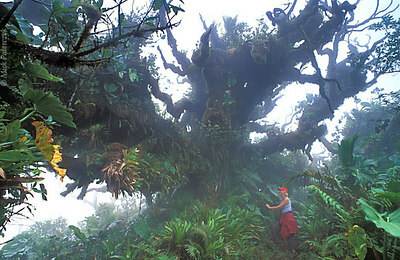 [ANTILLES.SABA 25.541] ’Monster tree’. In the cloud (Elfin) forest on the top of Mt.Scenery a Mountain mahogany thrusts out its moss covered limbs into the foggy sky as some alien monster. Photo Mick Palarczyk. [TURKEY.CENTRAL 26938 'Tuff cones near Selime.' 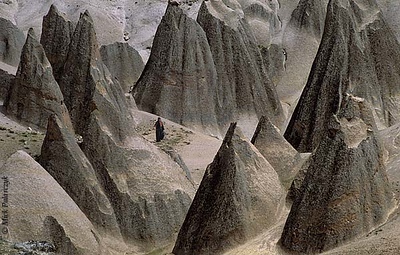 Sharply pointed rock formations of tuff (consolidated volcanic ash) create a weird landscape near the Cappadocian village of Selime, southeast of Aksaray. Photo Mick Palarczyk.